What is a Vertical Merger? A vertical merger is a union between two companies in the same industry but at different stagesBusiness Life CycleThe business life cycle is the progression of a business and its phases over time, and is most commonly divided into five stages: launch, growth, shake-out, maturity, and decline. The cycle is shown on a graph with the horizontal axis as time, and the vertical axis as dollars or various financial metrics. of the production process. In other words, a vertical merger is the combination and integration of two or more companies that are involved in different stages of the supply chain in the production of goodsInventoryInventory is a current asset account found on the balance sheet consisting of all raw materials, work-in-progress, and finished goods that a company has accumulated. It is often deemed the most illiquid of all current assets, and thus it is excluded from the numerator in the quick ratio calculation. or services. Synergies: operating synergy, financial synergy, managerial synergy, etc. A vertical merger facilities better coordination and administration along the supply chain. For example, the uncertainty of inputs and demand for a product can be minimized and costs of communication can be saved. A vertical merger integration helps in eliminating financial constraints by deploying surplus free cash flow to help the merging company grow, enlarging the debt capacity, reducing its cost of capital, and achieving better creditworthiness. A vertical merger increases managerial effectiveness by replacing the poor performing management team with the more effective one. Mergers may fail due to the inability to combine two distinct corporate cultures. When two companies merge, bureaucratic costs increase. The additional costs may outweigh the benefit gained from the merger. It is common for key personnel to leave the merged company due to the unwillingness to accept the merger or due to poor communication between companies. Backward integration involves merging with upstream companies (such as suppliers and producers). Forward integration involves merging with downstream companies (such as distributors or retailers). Consider the diagram above with producers, suppliers, manufacturers, wholesalers, and retailers. If Manufacturer A merges with Supplier A, it would be considered a backward merger – Manufacturer A is integrating with an upstream company. Backward integration would weaken supplier power. 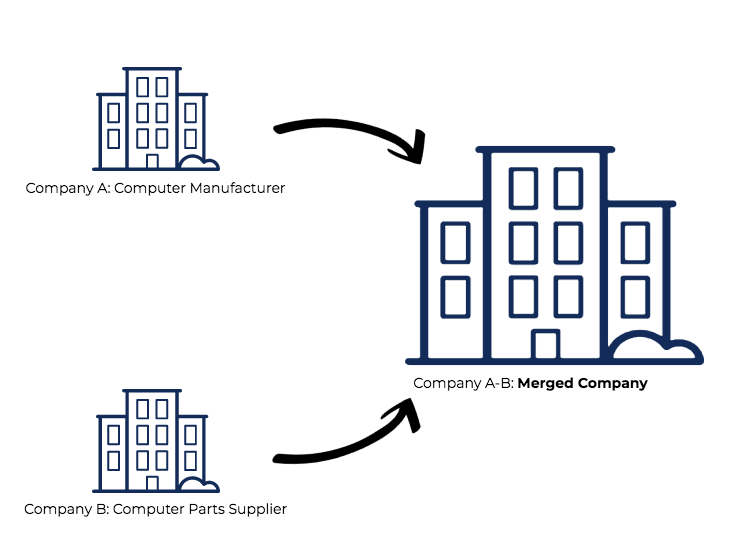 If Manufacturer A merges with Wholesaler A, it would be considered a forward merger – Manufacturer A is integrating with a downstream company. Forward integration would weaken buyer power. Company A is a computer manufacturer. Company B is the main supplier of parts to Company A. Therefore, the two companies are operating at different stages of the production process. Company A decides to merge with Company B to bring in operational efficiency. Through this merger, A-B Company can now buy supplies at cost and thus increase the profit margin of its products. In 2006, Walt Disney announced that it would buy Pixar in a deal worth over $7 billion and make Pixar its subsidiary. This was a vertical merger because Disney would benefit from owning the world’s most innovative animation studio while Pixar would benefit from Disney’s strong financials and extensive distribution network. Since then, the Disney-Pixar merger’s been considered one of the most successful mergers in recent history. Conglomerate MergerConglomerate MergerA Conglomerate Merger is a union between companies that operate in different industries and are involved in distinct, unrelated business activities.Conglomerate mergers are divided into pure conglomerate mergers and mixed conglomerate mergers.